Get out yer ‘California Prayer Book’ (deck of cards), it’s time for some Poker, and there’s a new game in town! The spirits of legendary Poker players, cowboys, outlaws, and lawmen battle with you between state lines on a Mississippi Riverboat… You must ‘Capture’ (Bankrupt) them to collect their Bounty. Win Tournaments to collect Gold and Silver to top the Medals Leaderboard and to raise your World Ranking. Build your Bankroll to play at the Highest Level! 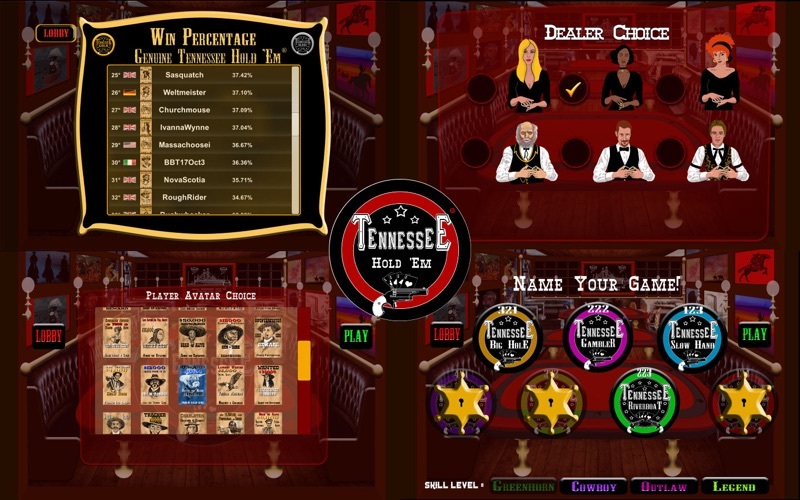 With a ‘West World’ selection of opponents, Tennessee Hold ‘Em offers a new challenge for poker players in the real and virtual worlds. Every Table you buy-into is an Elimination Tournament where your aim is to finish 1st or 2nd to be awarded a GOLD or SILVER Medal. 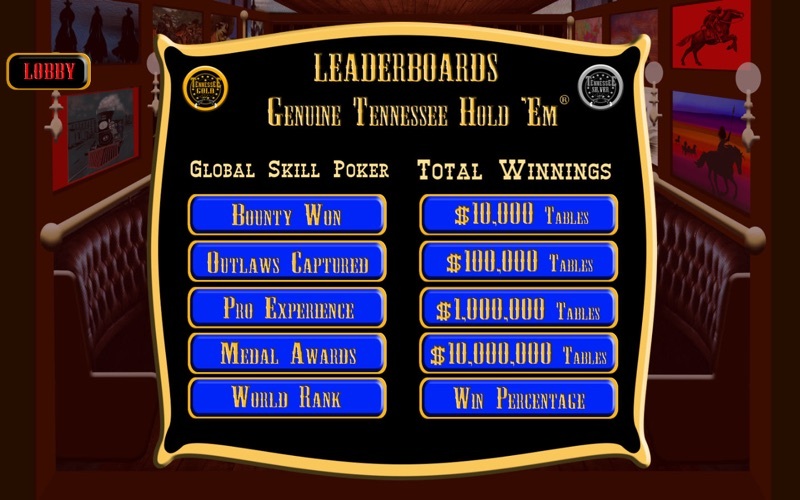 Tennessee Hold ‘Em draws upon a variety of poker skills. Players face tough decisions on how to play their hands. This strategic element doesn’t exist in Texas Hold 'Em or Omaha. 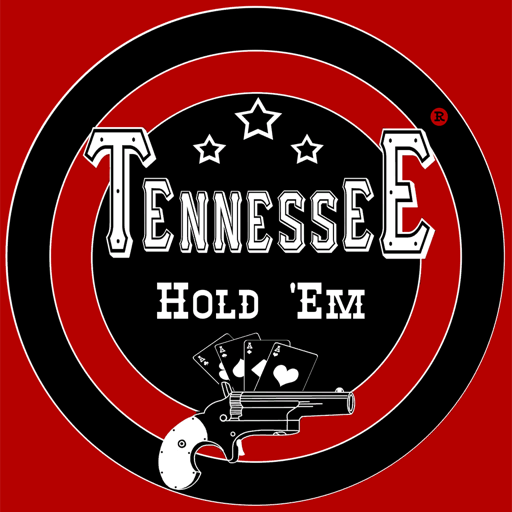 If you know how to play Texas Hold Em, it will only take a few minutes to understand Tennessee Hold ‘Em... That makes it sound easy, but it takes a bit longer to master! Tennessee Hold ‘Em is actually the name of a family of 7 game variations. Three of these are 4 Hole Card Games, and four are 5 Hole Card Games. 5 Hole Card games are considered ‘Advanced’ as they offer more strategic options. Players must master all 7 Games to win 7 GOLD Medals to win the $MILLION Chip Jackpot! 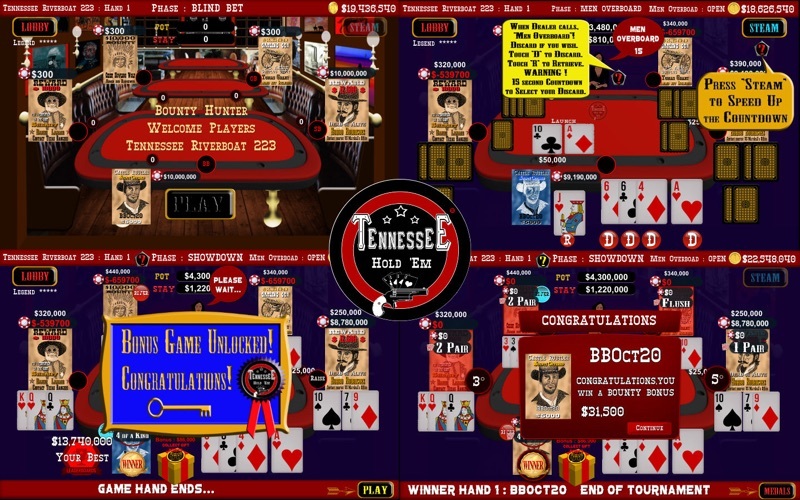 In Tennessee Hold 'Em, 4 community cards are shared. Players are dealt 4 or 5 Hole cards, according to the variation played. Only 7 Cards ‘count’ when building your best 5 card Poker Hand! You must decide whether to hold 3 or 4 (or 5, according to variation) Hole Cards. If you decide to hold 4, you may not use the RIVER. This applies to all variations. In 5 Hole Card Variations, players holding 5 Hole cards may use neither the TURN nor the RIVER. Unlike ‘Omaha’, if you’re lucky enough to be dealt 4 of a Kind, you can keep them all for the Showdown! In Tennessee Hold ‘Em 'Bounty Hunter' Tournaments, a graduated betting system keeps players playing. In Texas Hold ‘Em, more than 50% of players fold after seeing their Hole cards. In Tennessee Hold Em, Over 80% of Players stay in for the first 3 of 5 betting rounds. Greater Player engagement equates to higher levels of participation in the Showdown. Tennessee Hold ‘Em’s Progressive betting for Tournament play has another massive benefit. Players cannot be ‘bullied’ by others with big chip counts (as seen in pot limit and no limit Texas Hold ‘Em). Players may go ‘Into the Red’ and still complete the hand to compete in the Tournament if they win. This means smart players with small chip counts can often "Live to Fight Another Day!". Blind Bets Double every 6 Hands. (Hands 6, 12, 18) Tension mounts as the pots double whenever the Blinds Bell rings! Dynamic Discarding (known as ‘Men Overboard’) keeps players thinking strategically. 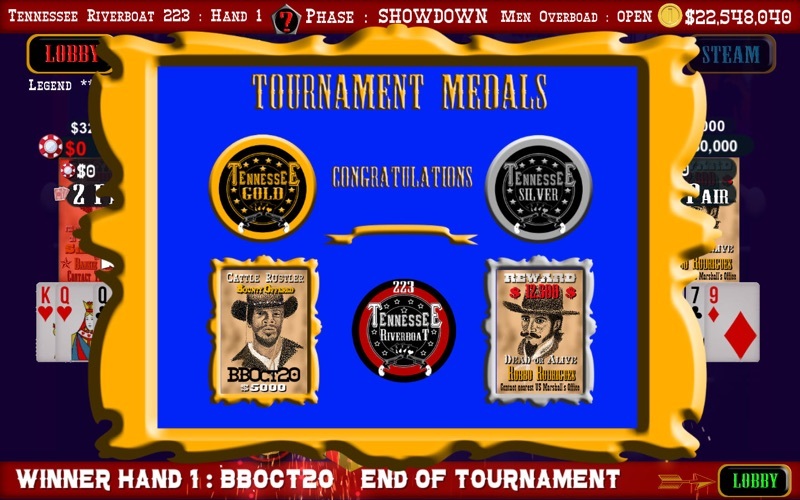 Tennessee Hold 'Em has higher average ranking hands in the Showdown than Texas Hold ''Em. This means more players stay until the SHOWDOWN to vie for the pot. With each of 5 card distributions, players build progressively better hands (or fold). ‘Men Overboard’ is declared by the dealer, calling for players to shed their (1 or 2) discards. When an ‘open’ hand is selected, the Dealer reveals each player’s discards, giving all players insight into opponents’ hands. ‘Men Overboard’ can even be used to bluff, giving opponents a false impression of hand strength. With any 'OPEN' Hand, in a 5 Player Tournament, playing any 5 Hole Card Game, up to 10 cards may be revealed. With each discard revealed, the odds of winning rise and fall. 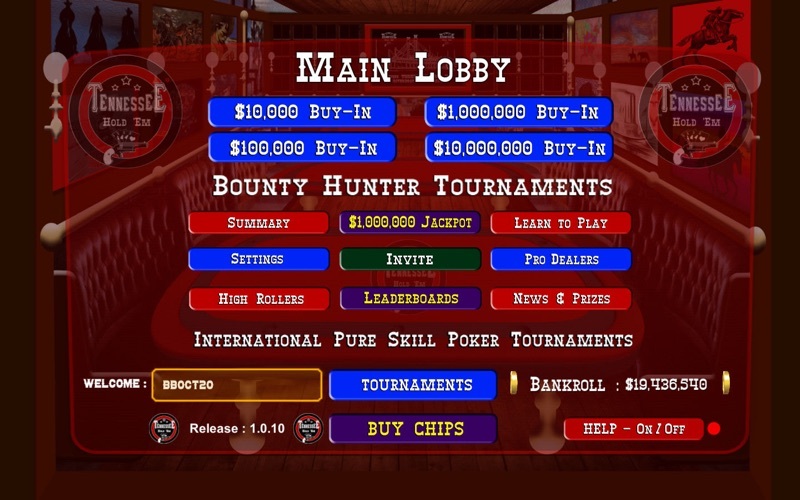 No other Poker game has this variety of skills and tactics to challenge and entertain players.